TOKYO – A 25-year-old man "tired" of life went on a killing rampage in a busy shopping area in central Tokyo on Sunday, plowing his truck into a crowd of pedestrians before stabbing passers-by with a survival knife. Seven people died and 11 others were injured in the attack. 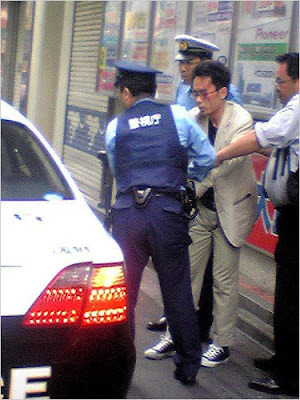 According to the Japanese media, Mr. Kato told the police that he had grown "tired" of life, "hated the world" and had gone to Akihabara to kill people. "Anyone was O.K.," he told the police, according to the Japanese media. Japanese television showed the police holding on the ground Mr. Kato, dressed in a black T-shirt, off-white trousers and jacket, and wearing sneakers, about five minutes after the attack started. Around 12:30 p.m., the suspect drove a white, two-ton rental truck into an intersection of the vehicle-free thoroughfare, making zigzags and hitting several people, the police said. The man then got out of his car and, yelling in a loud voice, began randomly stabbing passers-by, including a police officer, with a survival knife. Japanese television, displaying video that witnesses had captured on cellphones, showed bodies scattered in the area just after the attack. The authorities could be seen trying to revive several victims. Six men and one woman, ranging in age from 19 years old to 74 years old, died from their injuries, the authorities said. # Posted at 12:12 PM.